As an authorized dealer and installer of Tufdek™ vinyl decking in Saskatoon, we really are the experts to call when it comes to low maintenance, waterproof vinyl decking for outdoor areas. The Tufdek™ brand is a name that our decking company has come to rely on for many years. We have full confidence in recommending Tufdek waterproof vinyl decking products to all of our clients whether we are building a new deck or replacing old worn out vinyl decking. Each of our deck installers has completed Tufdek’s comprehensive installation program, and Tufdek’s impressive warranty ensures our customers are properly protected. We work with all types of customers in and around Saskatoon, Saskatchewan, including Architects and Engineers as well as building owners, property managers, and homeowners. In addition to installing Tufdek™ vinyl decking, we also design and build decks, gazebos, and pergolas, as well as install vinyl fencing, sod, and sprinkler systems. Need a new waterproof vinyl deck but on a budget? We finance all of the work we do at extremely low rates, with the lowest payments possible. If you live in the Saskatoon area and are shopping around for a new deck or to replace your existing deck surface, contact us, your Tufdek dealer, and learn how our Tufdek waterproof decking system is superior to any other similar product on the market. We will happily provide you with a no obligation, complimentary waterproof vinyl decking quote for your home or commercial project. 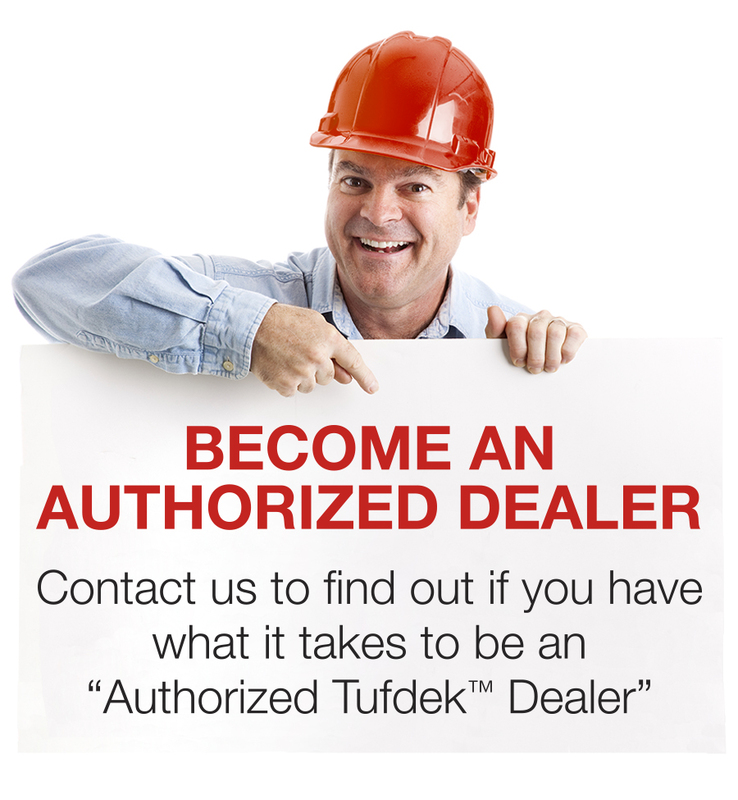 We are your authorized Tufdek™ Dealer for Saskatoon and we can help you realize the benefits of a Tufdek waterproof vinyl decking system. Guaranteed to be waterproof! For more information about how to protect your investment in your deck, talk to us by calling Tuff Industries at 1-877-860-9333 or complete the following contact form.